“Shall we play a game?” That’s a question I often avoid answering because I watched the movie! Seriously, you know the drill: a creepy computer voice asks you to play a game, and you say, "Sure! Why not?" Next thing you know… disaster. Yeah, I know you're thinking I'm overreacting. It's a harmless question. But no questions are totally harmless because the outcome can't be predicted. Let's take a murder mystery party. I always wanted to attend those. My niece attended one last year and told me she had a blast. Everyone was on edge trying to figure out who did it. So, I thought it would be great to list some great "whodunit" films that all begin with a seemingly innocent gathering. This will certainly give you pause when you’re replying to your next RSVP. Jason Bateman (Max) and Rachel McAdams (Annie) decided to add some flavor to their weekly couple’s game night thanks to Max's brother, Brooke. It's always the brother, right? Brooke believes it would be awesome to arrange a murder mystery party complete with thugs and federal agents. You already see the writing on the wall, right? Now, create this setting for six highly competitive gamers and the stakes become too high. Unexpected events occur. Total chaos and confusion. No one knows who is who. However, this could result in a night they always needed. And you thought you had issues? Career politician, Janet, thought it would be an awesome idea to celebrate her new post as the prestigious Minister of Health. She invites a few friends to dine with her and her husband, Bill, for an innocent night of great conversation and drinks. Someone should have told Janet that politics and alcohol don't mix. Soon this little soirée serves lies, secrets, and cynicism on a very cold platter. By the end of the night, the relationships will be forever altered. 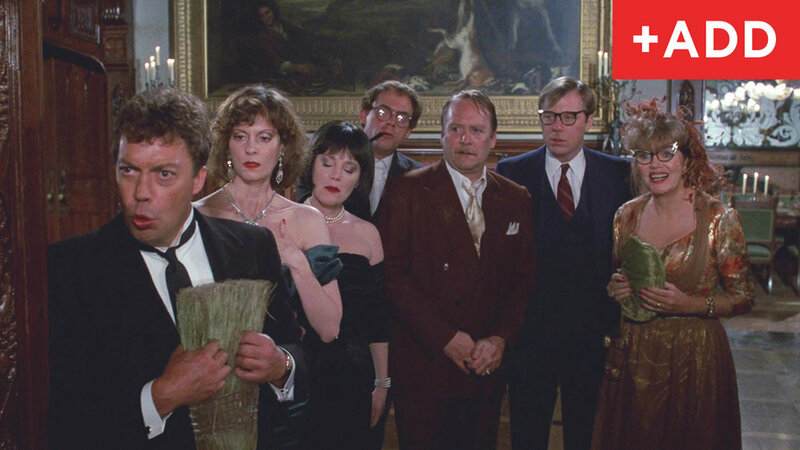 Based on a board game of the same name, Clue embroils six eccentric dinner guests in a masterful game of 'whodunit.' The best part about this film is the cast! Expect to laugh out loud. One of my favorite Agatha Christie films. Crooked House is the ultimate 'whodunit' film. It has everything which makes this type of cinema masterful – the death of a wealthy patriarch, greed, bitter relatives, and, of course, murder. Most of the story takes place at a sprawling estate. The most twisted part about this family is they care more about family secrets being divulged rather than finding out who murdered the grandfather. Talk about priorities. It's all about common sense, people! What part about your ex-wife inviting you to a dinner party to a house you once shared that is now enjoyed by her new husband that doesn't make your Spidey sense tingle? Apparently, curiosity gets the best of Will (Logan Marshall-Green) and he must see how Eden (Tammy Blanchard) is really living. When something smells fishy, and it isn't the fish, what will happen to Will? They say curiosity killed the cat. Let's hope Will has nine lives. Tiffany Unscripted has been the Managing Editor of Your Film Review for over two years at Occhi Magazine. She manages a small team of writers that cover all genres of movies, including writing featured articles on trending topics. In addition to writing, they cover live events, such as film premieres and screenings in Cleveland, Las Vegas, London, Los Angeles, New York City, Phoenix, and Silver Springs. She especially enjoys the opportunity to meet emerging talent who enjoy sharing their passion, journey, challenges, and success with our readers. You can learn more about Your Film Review at OcchiMagazine.com.